Buyers: Get Real to Get a Real Estate Deal! It's April, 2015 at the time of this writing, and the housing market has shifted from barely breathing to somewhere between healthy and booming, depending on your specific market. In the Lexington, KY real estate market, conditions have definitely shifted more in the favor of sellers, but it still isn't supporting over-priced listings in most areas. What this means is that homes priced "on market" (a Realtor term for homes priced within the average price range based on recent sales in your neighborhood) are selling quickly, often with multiple offers. In a multiple offer situation, these homes may very well sell at or above the list price, so in the end, the seller benefits much more from pricing it "on market" and seeing how the market responds rather than pricing it above the range indicated by comparing it to recent comparable sales. So that's great news for sellers (especially sellers in popular neighborhoods where there aren't currently many homes for sale) but what about buyers? How do you get the best deal in this bustling market if you want to buy a home in the Lexington, Kentucky area? 1. Don't start by looking at recently listed homes priced over your maximum budget in popular neighborhoods if you're expecting to purchase for much less than the listing price. If the home is priced "on market" for its condition and location, it will sell within a month or two at a price very close (or possibly even above) its current list price. Even if it's priced on the high end, if it's new to the market, the sellers are likely not willing to negotiate a significant amount off the asking price this early since they haven't had enough feedback from other buyers to convince them the home actually IS overpriced. So either the home is priced on market and will sell near this price soon or it's priced above market and the sellers aren't ready to accept that reality yet. In either case, making a $180,000 offer on a home listed at $200,000 in a hot seller's market like we have now in Central Kentucky most likely isn't going to accomplish anything for you and will be a waste of your time. If this were 2008, things would be different, but it's now 2015 and the market is what it is. 2. Don't base your opinion of a home's market value on the PVA "assessed" value. Often these two figures are very far apart. The PVA value is based on what the current owners paid for the property and often doesn't reflect improvements they've made to the property or neighborhood shifts that affect value (a Walmart's going up next door or schools have been redistricted since that purchase). The PVA office enters the purchase price as the base value and over the years, they apply an algorithm to adjust the value up or down based on market averages. The true market value is based on what other similar homes are selling for RIGHT NOW and no amount of reviewing old sales information for this house is going to change that. I can't tell you how times I've had prospective buyers tell me, "But they paid only $200,000 for the house 5 years ago -- there's no way it's worth $300,000 now." The amount they paid whenever they bought it has no impact at all on its market value now. Period. When an appraiser from your mortgage company goes out to do a comprehensive appraisal of the home's value, he will compare this house to other nearby homes that have sold in the past 6 months and see how it compares. He'll adjust for differences in square footage, hardwood floors vs linoleum, lot size, etc., and calculate the current market value. But one thing he won't consider when determining this value is how much the current owners paid. What if they inherited the house and paid nothing? Or what if when they bought it, it was on the verge of being torn down and needed $100,000 worth of work? Or what if they were just lucky enough to have purchased at a great price when the market tanked and now they're taking advantage of the strong real estate market in Lexington, KY? All of those things may affect the price they initially paid, but that doesn't mean they have any impact on the home's current market value. How can you determine what a "fair" price is for a home? Work with an honest, experienced agent who will also pull recent comparable sales data and advise you of what the realistic sales price of the home is. If you don't think you can trust your current agent to guide you competently on this, get another agent. That's our job and you want someone who's good at their job that you can trust. 3. Don't look for a home that's a major fixer-upper unless you're willing to borrow the money to fix it up as well. I'm not talking about a home that needs just cosmetic improvements here (painting over ugly walls, replacing old countertops, etc.). I'm talking about houses that won't currently be approved for a conventional mortgage because they need work to the foundation, roof or electrical/plumbing/heating/cooling systems. If you can perform this work yourself, that's great, but a traditional lender won't lend on a home that needs major work or doesn't meet important building codes -- it's a bad gamble on their part. There are loans out there in which you can roll in the cost of the repairs -- they're called 203K Renovation Loans -- and they're a wonderful tool to have at your disposal. If you find a $$325,000 home you can purchase for $250,000 because it needs $50,000 worth of repairs, you can borrow the $250,000 for the purchase PLUS the $50,000 for the repairs, but the repairs need to be performed by trained and/or licensed contractors. Even in situations where the work doesn't require a lot of training, many lenders frown on paying the home buyer to do the work themselves. They want assurance the work is being done properly to protect their investment and they figure the best way to ensure that is to hire independent licensed contractors. But if you find a great deal on a home with a great layout and in a great location, a 203K Renovation Loan can be a great way to get that home in top shape without having to fork over a huge chunk of money for repairs up front. 4. Don't get your hopes set on a "lease to own" purchase unless you've already saved up a decent down payment. At least once a month, someone comes to my site, picks out a dozen or so homes, and emails me asking if the owners would consider selling on a "rent to own" or "lease to own" basis. First, if the sellers were willing/able to consider selling on this basis, it would say so in the listing. Most homeowners can't afford to take out two mortgages at once and therefore can't afford to keep the mortgage on their current home and buy another home at the same time. So even if they wanted to help you out, they couldn't qualify for a second mortgage to buy a different home doing a "lease to own" option with you because in the bank's eyes, they're still on the hook for the first mortgage. Second, in situations where the sellers are willing/able to sell the property on a "lease to own" basis, they are usually still going to require a minimum of 3%-10% down or possibly even 20% down. Most prospective buyers who approach me about finding a "lease to own" property don't realize this. But again, the seller has to protect his/her investment and they do that by ensuring the buyer has some "skin in the game" up front and also has the financial resources to actually buy the home. Third -- in a market this strong with interest rates this low, think about the kind of properties being advertised as "rent to own." There are certainly some exceptions, but generally, if the home is priced "on market" and in good condition, why would the seller want to bother with having to collect a monthly payment from you when they could otherwise just sell it outright and collect all their money up front? The main reasons are A. Because the house is over-priced to begin with and unlike when you obtain a traditional mortgage, an appraisal won't be required up front in a "lease to own" purchase, so you may very well be paying more than the property is worth. In other cases, the property is very unusual, which may limit the general market for the property. In this case, the price may be fair and the seller may even be charging a fair rate for the financing options they're offering you, but keep this in mind -- if they had to resort to selling the property on a "lease to own" basis in a strong market because there were so few buyers for it, how easy will it be for you to sell down the road? Maybe you have great plans to improve it that will make it more appealing to more buyers, but this is definitely something to keep in mind. 5. Don't go looking for a home until you're clear on what you want and you've talked with a lender. In this market, the nicest homes are moving fast. If you start looking at homes and aren't sure what you want, how will you know if you've found it? If you and your spouse can't agree on whether you want a condo or a home on 5 acres, you probably need to work this out before you start looking. Meeting with your agent in advance to discuss your "Top 10 Must Haves" is a great idea and can help you refocus if you become overwhelmed at all the choices. If you find a great home and wait until AFTER you find it to realize there are several errors on your credit report and a lender won't issue you a preapproval letter until they're resolved, you may very well miss out on this home while waiting 30-60 days for these errors to be resolved. In that time period, most homes in Lexington that are priced on market will already be under contract to someone who DID meet with their lender in advance and came prepared with a preapproval letter. 1. Be realistic with your budget and expectations. If you can only afford to invest $200,000 in a home at this time, don't psyche yourself out by looking at $250,000 or $300,000 homes. The homes you can afford will only seem less appealing in comparison and the likelihood of your being able to purchase one of these more expensive homes for the price you can afford is pretty much non-existent, so you're wasting your time as well as that of your agent and the sellers by looking at homes you can't afford. Even if you're only viewing homes online, the same principle applies. If you spend your days perusing homes you can't afford, how likely is it that a home costing 20%-30% less is going to compare well when it comes time to buy. So focus on the homes priced in a range you CAN afford and keep in mind that no home is perfect -- unless you literally have an unlimited budget and are building a home from scratch, there will be something about every home out there you would consider less than ideal. But that doesn't mean it wouldn't be a great home for you at this time in your life. You start building equity now and in a few years, after a raise or two, you've now got more of a down payment to apply towards a new home and a larger monthly budget to afford a more expensive home. 2. Find an ugly home and use your imagination. Despite all the home decorating shows on TV these days, you'd be surprised at the number of homeowners who haven't updated their decor in 30 years and that lack of cosmetic updates will have a HUGE impact on their ability to sell their house right now. If they price it to compete with nearby homes that have been updated, it simply won't sell until they've lowered the price enough to make up for the updates it needs. But as long as the house is structurally sound (good foundation, roof, working heating/cooling, good electrical and plumbing systems) and the general layout works for you, this type of home can be a goldmine for those seeking a bargain price on a home in the Central Kentucky real estate market! Cosmetic updates don't have to be done immediately (if at all), so you can take your time and do as much of the work as you can yourself and then shop for bargains on the other items. The challenge here is being able to see past the ugly purple countertops or outdated furniture. These things are so easy to change (and obviously the furniture doesn't usually come with the house anyway) but seeing past them to what COULD be can be challenging. A key here is to focus on the immutables -- the things that will be the same regardless. Is it in a location/neighborhood you like? Does the layout generally work for you? Is the size of the yard ok? If these are mostly ok, try not to get caught up in the rest of it. Most home buyers won't be able to look past the existing finishes and wall colors -- if you can, this is a prime opportunity to snap up a bargain. 3. Buy when the market's slow. Now this may be a bit challenging right now since the overarching trend is that the market continues to heat up for homes and farm properties in the Lexington and Central Kentucky area. However, there are still ups and downs during a busy year and you may be able to take advantage of this. If a seller puts their home on the market just after school starts, for example, they will likely get fewer showings over the next month than they would have if they had put it on the market earlier in the year. Everyone with school age children is focused on getting them back in school at this point and this usually results in a dip in activity from mid-to-late August through mid-to-late September. If the seller starts getting anxious about the house not selling because of low activity at this time, they may be willing to negotiate more than they would if they were seeing more activity. The same is true of the holiday season. From mid-November to after Jan 1st, the market slows down while people focus on celebrating with their friends and families. While there are likely to be fewer homes on the market to choose from at this time, you will be competing against fewer buyers, so you're more likely to be in a stronger position to negotiate with the sellers. If they're willing to put up with the hassle of accommodating showings over the holidays, they're probably pretty motivated, so that puts you in a stronger bargaining position. 4. Find the worst/smallest house in the nicest neighborhood. If there's a neighborhood that's otherwise nice but one of the houses has a trashed yard or has been painted neon green, that's a bargain waiting to happen. If the house is already pretty nice but it's smaller (and therefore less expensive) than the other homes in the neighborhood, that's also a good sign of a bargain. The reason is that the neighborhood will support any improvements you do over the years because there are more expensive homes to compare it to. For example, you buy a 1200 square feet, 3 bedroom, 1.5 bath home in a neighborhood where most of the homes have 4 bedrooms, 2+ full baths and 1800+ square feet. If you decide to add on to this home at a later time or finish the unfinished basement/attic and add another bedroom and bathroom, there are plenty of nearby comparable properties to support the additional value you've brought to the home. Maybe you invest $30,000 in improvements but the value of the home is now $50,000 greater -- that's an excellent use of your time and budget! On the other hand, buying the largest/most expensive home in a neighborhood is usually not the best way to get a home bargain. This is because you've already "maxed out" your value at the purchase price, so if you decide to renovate or add on, it will be hard to recoup that investment since none of the other homes in the neighborhood will support a higher price. 5. Consider another area. In most metropolitan areas like Lexington, KY, homes closer to the centers of activity (close to Universities, shopping, dining, etc.) cost more and people are often willing to pay more for that convenience. But let's say you have 3 children and you really, really need a 4 bedroom home on a large lot. If you focus on areas really close to the main attractions, you're going to pay a lot more for a home than you would if you were willing to look at homes 20 minutes or more away. For example, instead of looking in the city limits of Lexington, KY for a home, maybe you could look at homes in Nicholasville, KY or Lawrenceburg, KY -- many people live in those communities and commute to 20-30 minutes to jobs in Lexington. But in those smaller communities, they are able to afford larger homes on larger lots and that trade off may be worth it to you as well depending on your situation. 6. One final note on getting the best deal on a home -- work with a realtor! I know this seems self-serving since I am a realtor, but keep in mind you pay nothing to an agent to help you purchase a home and their job is to help you get the best deal! When an agent has a home listed for sale, their primary goal is the get the seller the highest price. So if they're trying to get the seller the highest price, how can they get you the lowest price? If you'd like to meet and talk with me about the buying process or you've seen some homes in Lexington, Kentucky you'd like to view in person, just call, email or text me. My contact info is accessible at the top right of the page. 1932 Clear Water - New Ranch Home on Nearly 1/2 Acre! Get it while the getting's good! This lovely new ranch home is full of the most popular amenities -- hard wood floors, open, spacious floorplan, gas log fireplace and tall, airy ceilings! You'll love how the coffered beam ceilings add depth and drama to the great room and the bonus room over the garage is perfect for either a 4th bedroom, hobby room or spacious "man cave." 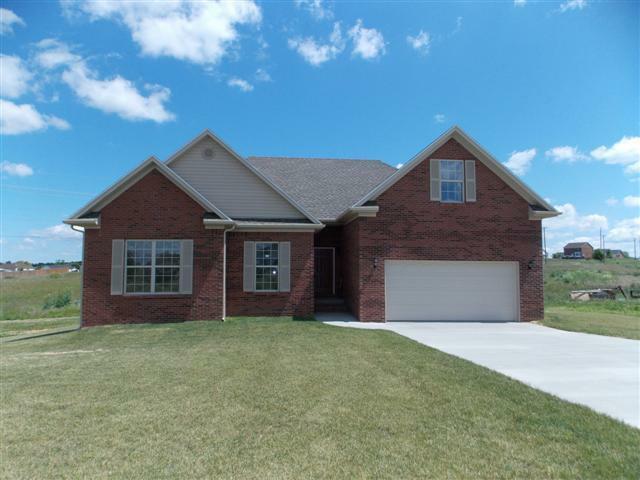 With 3 bedrooms and 2 full baths (4th bedroom optional over garage), ranch homes like this are hard to find in Lawrenceburg, especially on such a HUGE lot! Backing to a farm, you'll appreciate the peace and quiet of this neighborhood and you'll save so much time getting where you need to go since it's literally minutes to downtown Lawrenceburg, 10 minutes from Frankfort, 30 minutes from Lexington and 45 minutes from Louisville! Pictures posted are of the same model home constructed by this builder previously, so finishes will be comparable but may change slightly. Showings of actual home are available and showings of the same floor plan currently owned by a happy buyer can be set up on request. Roark Builders has been been quality homes in Lawrenceburg for nearly 40 years. Mr. Roark is a former Kentucky Housing, "Builder of the Year" and stands by his homes. The last home with this floor plan drew multiple offers and ended up selling above the list price, so get in on this beauty soon while you can still pick your paint colors and before other buyers drive up the price! Wow! Things are really hot in the Central Kentucky/Lexington real estate market right now! The latest statistics from the Lexington Bluegrass Association of Realtors indicate that sales are up 23% over this time last year and pending sales (homes under contract) up 25%. New construction permits are higher than they've been in 4 years and inventory is down 5%. What a great time to buy or sell a home in Lexington KY or Centraly KY! This is the first of what I hope to be many blog post on my brand new web site! I've switched to a different platform to enable visitors more control over how they search for homes and what information they see. You can easily search within a specific city/community within the Central Kentucky area (any area that's part of the Lexington Bluegrass Association of Realtors) and if you have any questions about homes or neighborhoods you see or suggestions for my web site, just let me know!